CYBEX 525AT TOTAL BODY ARC TRAINER - Pacific Fitness, Inc. The Cybex 525AT is ideal for workout spaces where space is at a premium – like hotels, corporate wellness centers, and residential environments. It delivers the legendary calorie burn, performance, and flexibility of all Arc Trainers, but in a streamlined package that delivers outstanding value. 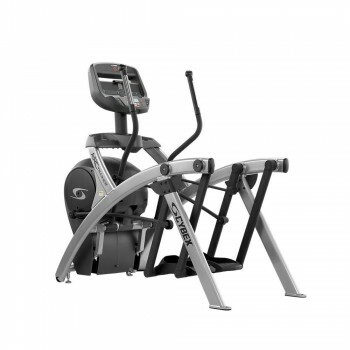 The Arc Trainer® burns up to 16% more calories than competing ellipticals or crosstrainers. It reduces knee strain by 83% and improves muscular endurance by 38%*. Take your Cybex 500 Cardio Series to the next level with Cybex FIT, an innovative iPad app that interacts directly with your equipment, transforming the console into an advanced touchscreen workout display. Users now have access to a full suite of digital features and controls that lets them personalize their workout experience. The 500 Series offers the industry leading Cybex commercial-level quality fitness equipment you’d expect, the durability and reliability you require and a new easy-to-use, centralized, console designed to provide an intuitive, accessible layout for users in managed and unsupervised fitness environments. A commercial-quality cross trainer with the patented Arc design that gives fast fitness results. Train for weight loss, strength and power on one machine. The Cybex 525AT Arc Trainer® offers broad incline and resistance ranges to do the work of three fitness machines in one. At the lower incline levels, the “glide” is a cross country skier. In the mid-range levels, the motion is a “stride” (like an elliptical except with proper positioning). At the high levels, it’s the “climb” of a stepper or climber. Research shows that the Cybex Arc Trainer burns more calories than any other cross trainer or elliptical tested. Cybex 525 cardio machines make innovative use of QR codes to provide users with easy access to equipment information and workouts via a mobile device. Guests, employees, and residents can select cardio workouts that best meet their fitness goals. The optional high definition 3 Cardio View high definition monitor offers three viewing modes on a 15.6” embedded display.